When severe storms take down the power lines, a whole-house generator installed by Marlock Electric can provide backup electrical power to keep key home systems operational. We install permanent generator solutions that provide better quality, durability, and protection than portable generators. When we install a standby generator in your home, you will have total peace of mind knowing that the generator will work every time you need it without any hassle. If you're interested in getting a permanent solution to protect your home from power outages, call Marlock Electric at 1-844-747-2911 today or click below for a free estimate! We provide generator installation in Farmington, Victor, Mendon, Geneva, Rochester, Ontario, Fairport and the nearby areas. ""What a difference between the Marlock crew and the other crew from the..."
"What a difference between the Marlock crew and the other crew from the utility company. All crews should be like Josh and Delroy, the world would be a better place." "Shawn was great to work with and Josh did a great job hooking up my..."
A permanent generator from Marlock Electric can end those problems. With a properly sized home generator, you won’t need to empty your refrigerator or move into a hotel. There will be no need to call upon friends if you need to take showers, wash clothes, or enjoy the comfort of heated or air-conditioned living space. When the grid goes down, a home generator comes to the rescue with backup electrical power. At Marlock Electric, we know that permanent standby generators are a significantly better option for homeowners than portable models. 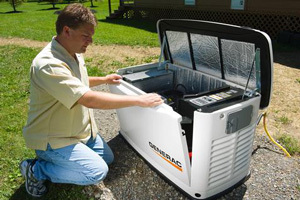 Portable generators can pose safety hazards if they’re not set up or operated correctly. Marlock Electric installs home generators that are designed to come on automatically when utility-supplied electricity is interrupted. Special circuitry is installed between the generator and your main electrical service panel can allocate standby electrical power to different circuits. This control circuitry ensures that key home systems (water heaters, HVAC system, refrigerator, etc.) can keep operating. Over the years, Kohler has become a multifaceted global family of brands that pave the way to enhance our customers’ sense of gracious living! We have more than 50 manufacturing locations on 6 continents, and more than 30,000 Kohler associates, making us able to present the idea of gracious living in every corner of the world. Our most popular generators for backup power provide award-winning reliability and performance. When you lose power during an outage or storm, the 20RESA KOHLER generator keeps your appliances working, the heat or air conditioning running and your security system on. Reliable: Equipped with a heavy-duty, commercial-grade engine that stands up to extreme weather. Quiet Operation: Quiet, neighborhood-friendly operation with sound levels similar to a typical central air conditioner. Premium Power: PowerBoost™ technology provides power to start large loads such as central air conditioners without dropping power to other appliances. Convenient: Runs on either natural gas or liquid propane (LPG) with simple switching between natural gas and LPG in the field. Remote Management: Compatible with optional OnCue® Plus and OnCue® Plus Wireless Generator Management Systems, and Programmable Interface Module (PIM). Outstanding Warranty: 5-year, 2,000-hour protection, and a corrosion-proof enclosure that’s built to last. Call us today for a free estimate on permanent standby generator solutions! Marlock Electric provides generator services in Perinton, Canandaigua, Webster, Pittsford, Penfield, Walworth, Newark, Seneca Falls, Waterloo, Macedon, and the neighboring areas in Greater Rochester area.